One of my favorite events of the year is the Downtown Alliance’s annual Dine O’Round. There are so many incredible restaurants in Salt Lake, and this event gives me an excuse to get out and try some places I haven’t tried yet as well as revisit some of my favorites. And at a really good price. This year, over 40 restaurants are participating in the event. Some offer lunches for $5 or $10. Many others are offering dinner for either $15 or $30. Some new restaurants I’d like to try this year are: CO2, Pallet, and Nordstrom’s Sixth & Pine. I’m sure I won’t get to all of these, but I’m going to make a valiant effort. Other tried-and-true restaurants that I would encourage you to check out are Stoneground, Copper Onion, Plum Alley, Bambara, Dojo, Fleming’s, Martine, Takashi and the Naked Fish. Phew. One that I definitely won’t miss is ZY. While many of these restaurants trim down their menu or offer a special Dine o’Round menu, Chef Matt Lake opens up his entire menu for the event. His approach is that he wants people to have the full ZY experience, and if it costs him a bit more, it’s worth it because it’ll give customers a memorable introduction to his restaurant. Last year I had the scallops appetizer (one of my favorite dishes in the city), flatiron steak, and dessert for $30. The fact that I still remember what I had a year ago should be a positive sign. If you are planning to visit one restaurant during the event, I’d highly suggest ZY. Chef Lake is doing some great things in the SLC culinary scene, and you should check out his innovative approach to American cuisine. You don’t need to buy passes or pre-register to participate in the event. 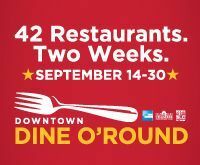 Merely show up at a participating restaurant between September 14th and September 30th, and tell them you’re there for the Dine o’Round. They’ll take good care of you. You can find the full list of participating restaurants here. Also, like the Downtown Alliance Facebook page and enter in their contest to win dinner for a year.